The pelvic floor is one of the many doming structures in the body that provide horizontal support. The above picture is a view of the pelvis from below. It shows the four key bony landmarks that form the diamond of the pelvic floor. At the top is the pubic bone, actually two pubic bones with the pubic symphysis between them. To each side of the horizontal line are the ischial tuberosities, or the sitting bones. And at the lower end of the vertical line is the coccyx or tail bone which is the very end of the spine. Take a moment to sit on a piece of paper. Lift up one sitting bone and touch it with your finger. Find where it would sit on your paper and place a dot there. Do this for the other sitting bone. Place your pen vertically right in front of your pubic bone and place a dot on the page. Do the same for the very tip of your tailbone. Come off of your paper and draw lines between all four of your points. Then draw lines running from sitbone to sitbone and from pubis to tail. Label your drawing. Where you have lines, there are muscles. Wherever there are muscles, there is the possibility for movement. Take a moment to look at the pelvic floor muscles for both the female and male anatomy. Notice the similarities. Notice the figure eight shaped muscles that runs from pubis to tail and encircles the pelvic openings creating sphincters. Notice too the large muscle that fans from the coccyx out toward the sitting bones and under the more superficial muscles to attach to the pubic rami. This is the primary doming basket structure of the pelvic floor. Below is a sequence to begin waking up the pelvic floor. Get into a comfortable all-fours position. Find the tail bone and begin to explore movement initiated from this place. Don’t isolate the movement, but rather allow it to ripple through your spine. Continue for several minutes. Then move your attention to your right sitting bone allowing movement to begin from here. After several minutes of exploration, bring your awareness to the relationship between the right sitting bone and the tail. Let them move towards each other and away. Let one initiate and the other follow. Let it become a playful dance. After several minutes. Do the same sequence on the left side. Once you’ve completed the left side, expand your awareness to include both sitting bones and the tail. 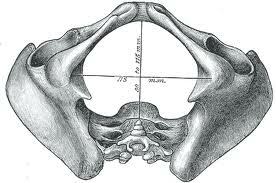 This is the back half, or back triangle, of your pelvic floor. Let the three points move in toward each other and then spread away from each other. Notice what kinds of movements or asana this facilitates. Now do the same for the front triangle of the pelvic floor. Begin with the pubic bone. After some time, go to the left sitting bone. Then relate the two to one another. Go to the right sitting bone. After some time relate the right sitting bone to the pubic bone. And then bring all three points into your awareness. Gather all three points together and then let them spread away from each other. Notice what kinds of movements or asana this facilitates. Then begin to balance the back and front of your pelvic floor. Let that balance inform you as you do different poses and exercises. When you are ready, you can then break the pelvic floor up into its right side and left side, exploring in exactly the same way. Once you have woken up the right and left triangles of your pelvic floor, begin to relate them to their corresponding legs and feet. Let this inform your practice of asymmetrical poses allowing the left pelvic floor and pelvic half relate to the left foot and leg, and the right pelvic floor and pelvic half relate to the right foot and leg. Remember, practice makes practice. Happy practicing!